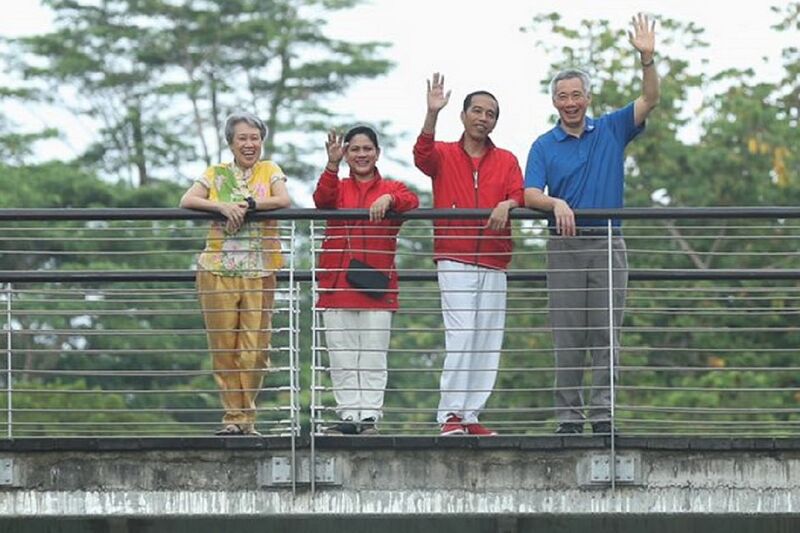 SINGAPORE - Prime Minister Lee Hsien Loong and Indonesian President Joko Widodo planted a tree in the Learning Forest at the Singapore Botanic Gardens on Thursday (Sept 7) morning, at the start of a one-day Leaders' Retreat to mark 50 years of bilateral ties. The tree, dubbed the "RISING Tree", is a Sunda Oak that is native to both countries, the Prime Minister's Office said. RISING is an amalgamation of "RI" for the Republic of Indonesia and "SING" for Singapore. Following the tree planting, the two leaders and their spouses, Mrs Lee and First Lady Iriana Joko Widodo, had breakfast at The Halia restaurant in the grounds of the Botanic Gardens. PM Lee later shared in a Facebook post that they had nasi lemak for breakfast. "We last had breakfast together in 2014, so it was nice to have them all visit again," he wrote. The two leaders will meet at the Istana later on Thursday for the retreat, where they will exchange views on regional and international developments, review the progress of bilateral relations, and explore new economic collaboration, security cooperation and cultural exchanges. They will also follow up on discussions from last year's retreat, in the areas of energy, digital economy, tourism and skills training. Singapore Post will release a joint stamp issue to mark the occasion. A highlight of the retreat will be a fly-past in the afternoon by F-16 fighter jets from Singapore and Indonesia. To mark the golden jubilee of bilateral relations, the F-16s will form the numeral 50 in the sky over Marina South, in a historical first that involves aircraft from the two air forces. PM Lee and President Joko will witness the fly-past. Later in the afternoon, the leaders will attend the Singapore-Indonesia Investment Forum at the Marina Bay Cruise Centre. President Joko is accompanied by a high-level delegation, which will meet its Singapore counterparts comprising Deputy Prime Minister Teo Chee Hean and other Cabinet ministers. On Wednesday evening, about 1,800 Indonesians working here turned up at the Indonesian embassy in Chatsworth Road to meet President Joko.